It amazes me how otherwise intelligent people often get trapped in error; and those errors are frequently linked. Feeneyites becoming Home Aloners is one such tangled web. Gerry Matatics was a Protestant minister, then became a member of the Vatican II sect teaching at the seminary of the Fraternal Society of St. Peter (FSSP), then he became a Traditionalist, fell into the error of Fr. Feeney (denial of Baptism of Desire [BOD] and Baptism of Blood [BOB]), and finally denied that there is jurisdiction for Traditionalist priests to function. (I'm told Mr. Matatics is no longer Feeneyite). He now spends his days going on "mega-tours" visiting a few people in various cities to tell them they must stay "home alone" and not join any Traditionalist chapel; a form of "spiritual house arrest." Theresa Benns is a Home Aloner who engineered the "election" of David Bawden as "Pope" Michael in 1990 by his mother, father, two nice neighbors, and herself during a "Kansas farmhouse conclave." She subsequently wound up denouncing the very "pope" her vaunted "research skills" helped to elect. Bawden "excommunicated" her, and she sits, once more, Home Alone and denigrates the learning (!) of Traditionalist clergy. (Benns is not a Fenneyite, but obviously concocts some strange ideas about papal elections). This past Saturday, July 2nd, I was issued a challenge via the comments section on last week's post about Bishop Kurz. One Eric Hoyle was a member of Most Holy Family Monastery in New York, run by the Feeneyite Dimond "Brothers." Mr. Hoyle, a wealthy young man, decided to leave his Protestant religion in which he was raised, and join the Dimond's monastery. He joined them in September of 2005, and donated approximately two million dollars in cash and stock. Hoyle left on or about December 2007, after some doctrinal disputes with the Dimonds. Hoyle then files suit in federal court demanding his money back. On June 22, 2012, U.S. District Judge John Curtin dismissed the suit in favor of the Dimonds.
" We now know that we are in a state of sedevacante, so priests and bishops can function by means of supplied jurisdiction until such time as the Church should return to Her usual mode of operation. The position of the so-called "Home Aloners," contending that you must stay "home alone" due to a lack of Ordinary jurisdiction in this time of near universal apostasy, is just pure theological ignorance many times discredited." Could you point me to some articles that explain the details of supplied jurisdiction in our times? For example, what is its basis in law, custom, and/or theological commentary? To whom is it supplied? For the internal forum only, or also for the external forum? Is it limited as to persons, times, places, matter, or circumstances? I suppose these questions should be easy to answer, if all that can be said against supplied jurisdiction is just pure theological ignorance many times discredited. Of course bad arguments have been used in support of a “home-alone” position, but the same can be said for most any position. Bad arguments need not concern us. I've done some research on supplied jurisdiction for confessions; the result is here. I'd be most grateful if you could point out where I'm in error. Thanks and may God bless you." He links me to a 192 page monograph that attempts to prove that Traditionalist priests have no jurisdiction to hear Confessions, except when someone is in immediate danger of death. Of course, there are rare exceptions explored, and he does not claim to pronounce definitively on the subject in his "book," but as you can see from the comment he e-mailed, he seems pretty sure of himself. I don't have the time for a 192 pg rebuttal because the practice of law and having a family is time consuming, so I have but one post per week on Mondays. Having skimmed through his monograph, I will attempt to point out the basics of what's wrong with his contention in this post. There are two questions that need to be explored: (1) Can God supply jurisdiction outside the norms of the 1917 Code of Canon Law, and (2) Does God supply jurisdiction through extraordinary means, or is there a solution within the Code of Canon law itself? God normally supplies the grace of Baptism by water. However, God is not constrained by His precept. BOD and BOB can substitute for water. Likewise, God is not constrained to supply jurisdiction as spelled out in Canon Law. Jurisdiction itself is necessary, how that jurisdiction can be obtained is not dogmatically defined. Conclusion: God could supply needed jurisdiction outside of the constraints of Canon Law. There are logical grounds for implying extraordinary conferral of supplied jurisdiction outside of Canon Law. Conclusion: We could safely infer God does supply jurisdiction outside the Code. 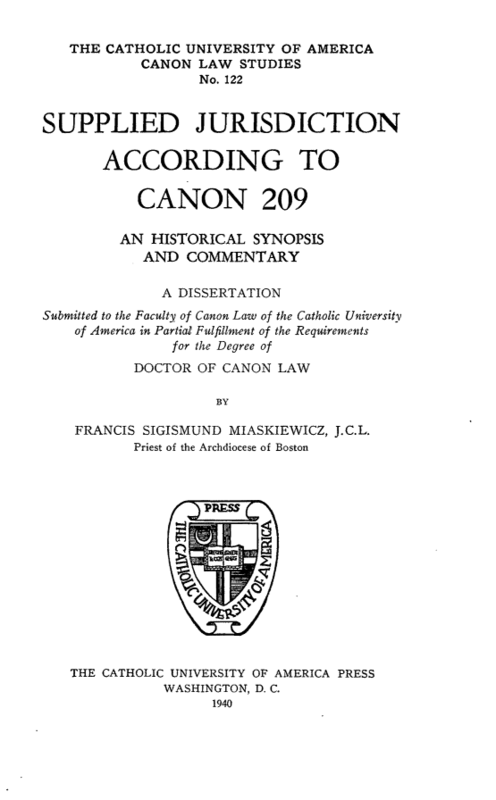 Canon law embodies some prescriptions of Divine Law and some of ecclesiastical origin. For example, the need for natural water in baptism is of Divine Law. You could not substitute milk for water, even in danger of death. No pope could change this, because the requirement comes from God. On the other hand, the need for a papal mandate to consecrate a bishop, or the amount of time needed for the Eucharistic fast is of ecclesiastical origin and is subject to change by the Supreme Pontiff, who is above Canon Law. As a matter of fact, the Eucharistic fast was modified by Pope Pius XII. Could a real pope modify Canon 209 dealing with supplied jurisdiction? That jurisdiction is necessary for the validity of confessions is of Divine Law, how it is given has never been dogmatically defined. 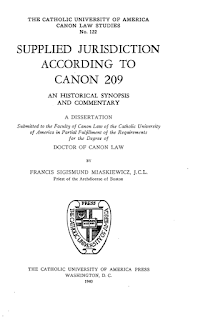 I know of not one approved pre-Vatican II canonist or theologian who teaches that the norms for supplied jurisdiction within the 1917 Code of Canon Law is of Divine prescription and could not be changed. Hence, a pope could change the way jurisdiction is supplied. The means of giving jurisdiction is therefore of ecclesiastical origin and can be altered. The Divine Law trumps ecclesiastical law. There is good cause to believe that God must supply jurisdiction outside of canon law, because of grave harm to the faithful. The Home Alone ("HA") position would have us deprived of Confession in virtually all cases outside immediate danger of death. The consequences of this cannot be limited to the sacrament of Penance. It affects the Holy Sacrifice of the Mass, the Eucharist, and Holy Orders. As a corollary of not having Confession, we would then be deprived of the Holy Eucharist. Remember that the Eucharist gives us great Graces. It is Divine Food for the soul, preserving and increasing the supernatural life of the soul. "Reception of the Blessed Eucharist is not necessary by an absolute necessity of means, but by a relative or moral necessity...It follows from the definition of the purpose of the Eucharist as nourishment for the soul, that without it supernatural life cannot be permanently maintained." (See theologian Ott, Fundamentals of Catholic Dogma, pg. 397). To receive the Eucharist worthily, one must be in a state of Grace. Confession before Communion, not an act of perfect contrition, is to be used except in extraordinary circumstances. What constitutes such circumstances whereby the Sacrament of Penance may be replaced by an act of perfect contrition? According to canonists Abbo and Hannon, "Examples of cases in which an act of perfect contrition suffices are not many. If the communicant is already at the rail before he remembers an unconfessed mortal sin, the act of perfect contrition suffices. This is also true if a member of a wedding party, when all its members are to receive Holy Communion on the morning of the wedding, remembers on the morning of the ceremony that he is not in the state of grace. In 1938, the Sacred Congregation of the Sacraments issued an instruction with regard to the reception of almost general daily communion in boarding schools and religious houses in which, among other provisions, it required that, to prevent the danger of the sacrilegious reception of Holy Communion, a confessor should be available on the occasion of the distribution of Holy Communion." (See The Sacred Canons, 2:856-857). In regards to regaining the state of grace, "the Council of Trent forbade under penalty of excommunication the teaching of the view of Cajetan, who held that the obligation of recovering the state of grace through confession was not a grave one." (Ibid, n. 22 pg. 800). So the reception of Communion, and the ability of any priest to offer the Most Holy Sacrifice of the Mass (should he commit mortal sin) disappears under HA theory. Priests and bishops would be prevented from offering Mass and hearing Confessions, so why have them? This would be a grave and harmful situation, and would seemingly prevent the Church from carrying on Her Divine Mission. However, the Church can not be impeded from Her Divine Mission and could never sanction any law conducive to the injury of souls. "The church's infallibility in disciplinary matters when understood this way, harmonizes beautifully with the mutability of even universal laws. For a law, even though it be thoroughly consonant with revealed truth, can, given a change of circumstances, become less timely or even useless, so that prudence may dictate its abrogation or modification." (See Van Noort, 2:115; Emphasis in original) So if the law for supplied jurisdiction doesn't cover the extraordinary times, God can make it so; He is not bound by Canon law! Conclusion: We can safely imply God supplies jurisdiction for Traditionalist priests and bishops. As Traditionalist John Daly notes, we are in "the same position as those who are captives among infidels with small hope of liberty and with excellent reason to believe [we] will never have access to any priest possessing jurisdiction in the future. Thus we can be sure that any truly Catholic priest to whom we do have access, even if he be bereft of jurisdiction and laboring under excommunication, can lawfully and validly absolve us." Mr. Hoyle, I hope you are in good faith. Your academic credentials and writing/research skills are outstanding. What great work you could do for the remnant Church! I really don't know how you fell in line with sophists like the Dimonds and gave them such large sums of money which will spread the Feeneyite error. While the Church does supply needed jurisdiction for Her priests, She can't supply anyone with good judgement and common sense. I'll be praying for you. If Mass is in the morning then fasting from midnight is feasible. But sometimes it is in the evening. My Sunday Mass starts just after 11am. Do you think I should keep the fast from midnight? There is no good reason to endanger your health like that. If you are in great shape and can fast for approximately 12 hrs, you can offer it up to God as a penance. However, we are all free to use the 3 hr fast decreed by His Holiness Pope Pius XII and should make use of it without any scruples of conscience. This is the first anonymous comment.We normally fast for 12-13 hour's for Holy Communion.Everyone should fast after midnight for holy communion...I can tell you from personal experience its highly rewarding. Disagreement's are fine once again,no problem! After midnight holy communion fast would be a great sacrifice for sin in our sinful,lustful,glutinous, angry,greedy,prideful,modern World. Offer up your thirst and hunger in reparation for our world and our sin's! These comments are out of sync with the subject of the post. Yes. I only mentioned the Eucharistic fast as an example of ecclesiastical law in the post. I will publish and entertain most all comments that are in good taste, sincere and have some connection to the subject. You are correct that the comments are getting too far off the subject. I made a comment,then responded to 2 people. The reason for my first comment was my belief the Holy Communion fast being changed heavily contributed to this nightmare disaster that has been going on since the mid 50's. If my comment and response are off topic and troubling,maybe you should delete them,including this one.No harm or disrespect was intended and I apologize. Your comments are not troubling my friend! You are kind and sincere, no need to apologize. I just want to make sure that comments don't get too far astray from the topic I post. I'm glad you posted and hope you will continue to do so! I was born in 1954 and left the church in my teens. I sought to come back to the Church in the early 1980's and could not understand what had happened to the Church. It was not the Church of my youth and I went from Church to Church seeking the Church I left and couldn't find it. I went to NO confessions and more NO confessions. I talked to young Priests who told me to go see a psychologist or counselor. Two Easters ago I began questioning things I heard in the media regarding Pope Francis and googled "is Pope Francis Catholic"? I ran across a traditional website, found a Priest with valid orders (ordained in 1951) and went to confession. I had finally experienced and found the power of the Priesthood and my sins were finally absolved by a valid Priest. I quit going to the counsellors (which never helped me anyhow), stopped going to the NO and vowed never to set foot in a Novus Ordo service again. I started going to a Latin Mass said by the valid Priest who heard my confession. My life has totally changed and I thank God everyday as I am so grateful to finally "come home" to the Church of my youth. I had people tell me that because of the jurisdiction issue, I should stay "home alone". Thanks be to God that I didn't listen to the home aloners. I go to confession regularly with a valid Priest and go to Communion every chance I get and the graces I have received and the healing of my soul that I sought for so long has finally taken place. Please keep up the wonderful works you do on this website to help show us lost souls the way "home". Deo gratis! What a wonderful story of God's mercy and Grace! Please pray for me because I'm ever mindful that whatever good this blog does, it is because I'm His unworthy instrument. Great article, I always look forward to reading your blog every week. What do you think of the Dimond brothers other works or videos? Their video 'death and the journey into hell' was very intense and really helped to wake me up. Thanks for the kind words, Cliff! Admittedly, the Dimonds have done much good in helping people realize the Vatican II sect is not the Catholic Church. I have not seen the video in question, so I cannot comment on it other than to say that if it was a fair and frank look at the NDE (near death experience) then it's something good. Be careful when looking at these NDEs. There's some good objective research on them you may also want to read. I say to be careful because you are dealing with much subjectivity. Sometimes it will lead people to think that all people go to Heaven because persons of different religions claim to "go towards the light." On the other hand, the Dimonds may have a hidden agenda and portray things that would promote their Feeneyite cause; I say maybe because to be fair, I have not watched the video. The negative side is the constant promotion of the Feeneyite error, and in my opinion, dwelling on things such as UFOs. To outsiders, this only serves to make Traditionalists look strange and prevent people from looking at our real beliefs. Thank you for the reply, I always appreciate your insight. This article is excellent and not many people tackle this issue. (Fr.Cekada and this blog being the few I can think of off hand)As a result of not being challenged much,the home alone sites receive this unspoken authority. God bless you for these article!Indeed,the supreme law of the church is salvation of souls. Secondly,who gave the home alone sites 'the authority' to decide what we Catholics practice? The Home alone sites always silently avoid that uncomfortable Q & A. So true! Thank you for your kind comment and be assured of my prayers. Excellent article on HA and Jurisdiction. One thing you may have implied but didn't make totally clear is that Jurisdiction is supplied by the Church for each instance in which it is necessary. There is no such thing as permanent jurisdiction being "supplied" to any priest or organization, as, I believe, some in the SSPX teach. God Bless you. You are correct my friend. God supplies jurisdiction "in actu"-- in the act of absolution itself. Jurisdiction is not permanent as the SSPX thinks; and have even set themselves up as an "über -Magisterium " by "checking" the work of the man they consider pope and his "bishops" (e.g. They have SSPX marriage tribunals re: annulments). You're in my prayers, and God bless! I think the stay at home sedevacantists are more truthful than the rest. Often when people have been involved with these sects for any length of time they begin to realize something doesn't feel right. I've read all the arguments for both sides and just don't agree with the whole supplied jurisdiction / epikeia arguments. "Involved with these sects"? You words speak volumes. Are you suggesting that Traditionalists are not True Catholics, but a man-made religion like the Vatican 2 sect? Secondly, I know of no one who has become a Traditionalist and left because it "doesn't feel right." For the record, I've been around along time having left the Vatican 2 sect for the True Church in 1981. You claim to have read both sides of the issue. How would you refute what I wrote, specifically with St. Alphonsus? Please give me a valid Catholic priest,valid holy sacrifice of the mass,and valid Sacraments any day over the man made,man centered,new age,pagan novus ordo. I left the novus ordo in 2014 not because 'it didn't feel right' but because it is satanic new age heresy. At the risk of sounding Protestant, "Amen!" I'm glad God showed you the way out of there and to where we all belong ---His One True Church! Now there's intelligence. Translation: I don't care what the Church teaches about jurisdiction and liceity, just give me a Latin mass, even if it's from Jack Smith, the layman who went to Canada and paid an old Catholic to give him ordination. Amen! Your translation is defective. Go back and read what was written: "a valid Catholic priest, valid Holy Sacrifice of the Mass, and valid sacraments." This person wants a properly trained and validly ordained CATHOLIC priest who has the true faith, Mass, and Sacraments. Someone who would go outside the Church to receive dubious orders without being properly trained does not meet the requirement of a valid Catholic priest. As far as the teaching on jurisdiction, go back and read what St Alohonsus wrote. It must be wonderful to know more than such an eminent Doctor of the Church! As the title of my post says, the Church can't give anyone common sense---even the obtuse who need it most. I love how people who hate the true Catholic Church never ever bring sound reason,logic, or FACTS to the debate. Sedevacantist's are hated because we cling to the truth.If Jorge Bergoglio were a Catholic Pope,the world would revile him.Instead he is loved and adored by the masses. Jesus Christ stated if they hate me they will hate you. Keep this blog going you are doing good. I find this all a bit confusing. What questions specifically, would I need to ask a Priest serving Latin Rite to know if I found valid place to receive all sacrements? I am desperately searching many years since feeling an irresistible call from G-D. Grew up and confirmed Catholic, I am 58 yrs old and do not recognize the Church. I started several years ago with the Bible scripture. Have been to many Protestant and Catholic services that seem to over exagerate the Love and easy believism. Leaving less enthusiastic then when I arrived. I am just now studying the sedevacantist position and it has renewed some hope. However I find it difficult to accept the stay Home position, unless there is no recourse. If you can help I would be deeply in debt for your kindness. I am in Baltimore, MD and have found one Church serving Latin Rite. Is that enough? What do I ask the Priest? To know I have valid sacraments from them. My post of November 14, 2013 "Can A Traditionalist Attend Mass At SSPX?" It should answer all your questions. If you read that post, and are still confused, please send me another comment here, and I will be glad to break it down as simply as possible for you! God bless you and guide you as you come to the Truth! I would like to ad a comment if possible.The Thuc line is valid.If the person in Baltimore needs any info,Thuc bishops.com explains this very well. I live in Baltimore and came home to the True Roman Catholic Church 2 yrs. ago. I am a sedevananist and go to confession and to a Latin Mass by a validly ordained Priest. I would be glad to share with anonymous above; however, I do not know how to make contact with them?? Nor do I Joann. Posts come to me without contact info. You can post what you want here, and hope she reads it. BTW, look for the post on invincible ignorance Monday, August 8, 2016. There is a SSPV Chapel in Brooklyn, MD, a suburb of Baltimore. The SSPV website has the contact info listed. Introibo - Looking forward to the post on invincible ignorance. Thank you JoAnn. Very deeply appreciated. You all have been awesome. Again thanks JoAnn and all. In response to you name.